To that end, Himmler gathered around him­self some of the vilest ghouls in Hitler’s pan­theon of evil, in­cluding Reinhard Heydrich, one of the archi­tects of the “Final Solu­tion,” and Heydrich’s able lieu­ten­ant Adolf Eich­mann, Gestapo chief of the mur­derous Depart­ment for Jewish Affairs. From 1,000 strong in 1929, Himmler headed an organization of 200,000 in 1934. That same year a reno­vated Renais­sance castle in North Rhine-West­pha­lia, Wewels­burg, was turned into the “Reich SS Leader­ship School,” where the leading cadre of the “Gen­eral SS” (All­ge­meine-SS) and the “Armed SS” (Waffen-SS) were to engage in rig­orous phy­si­cal training and study pre- and early history, mythology (Himmler adapted the idea of the Grail to create a heathen mys­tery for the SS), astron­omy, and art. Himmler planned to make Wewels­burg the “center of the new world” (Zen­trum der neuen Welt) following the “final victory.” When the “final victory” failed to mate­rialize, Himmler ordered the SS to destroy the Wewels­burg, which it did on March 31, 1945, three days before a unit of the U.S. Army Third Armored Division seized the grounds. 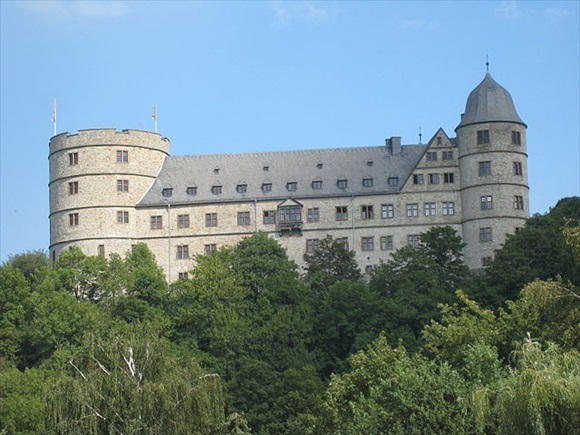 Above: Wewelsburg Castle, built between 1603 and 1609 in the northeast of North Rhine-Westphalia, was the planned site of Himmler’s “Reich SS Leader­ship School” (Reichs­fuehrer­schule SS). Actual in­struc­tion never took place there. Instead, the castle was trans­formed into an iso­lated cen­tral meeting place for the highest-ranking SS officers. Today the castle serves as a youth hostel, one of the largest in Germany. Photo taken in 2010. Left: Head of the Schutzstaffel from 1929 to 1945 and chief of the Gestapo (secret state police) from 1934 to 1945, “der treue Heinrich” (the loyal Heinrich) was second to Hitler as the most powerful man in Nazi Germany. 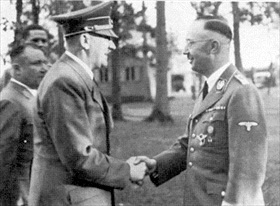 From 1943 to 1945 Himmler held another post, Minister of the Interior; in this position he was one of the persons most directly responsible for the Holocaust. 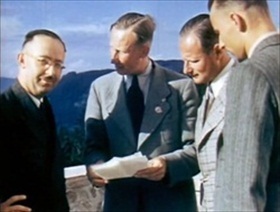 Right: Himmler with Reinhard Heydrich (holding sheets of paper) at Hitler’s Bavarian retreat on the Obersalzberg, 1939. Heydrich, ruthless head of the Reich Security Head [Main] Office (RSHA), worked under Himmler. In July 1941 Reichsmarschall Hermann Goering ordered the conscienceless and more-than-willing Heydrich to prepare the “Final Solution”—the extermination of all Jews in Europe. 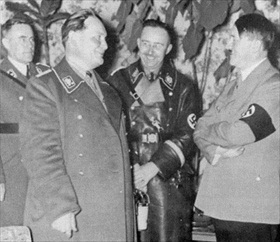 Left: On the day of the invasion of Poland, September 1, 1939, Hitler tapped Goering, here seen with Himmler, to be his successor. From 1942 onward Goering largely withdrew from Nazi Germany’s military and political scene when the Luftwaffe, which he headed, stumbled on both the Western and Eastern fronts. 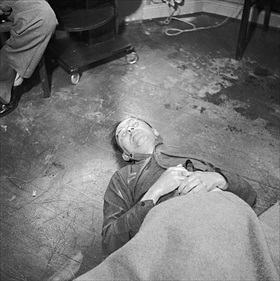 Right: Himmler’s body on the floor of British 2nd Army HQ after his suicide on May 23, 1945, during a routine interrogation. Two days earlier Himmler, a fugitive using an alias, had been detained at a British checkpoint. During his interrogation Himmler revealed his true identity.